VANCOUVER - Last season's anaemic power play was one of the big reasons why the Vancouver Canucks missed the playoffs for the first time in six years. It's early, but the man-advantage unit is showing signs of life with the 2014-15 campaign just around the corner. Radim Vrbata scored on the Canucks' only power-play chance in Monday's 4-2 pre-season loss to the Arizona Coyotes, giving Vancouver a 4 for 8 success rate over its last two exhibition games. The free-agent signing is starting to mesh with Henrik and Daniel Sedin on the top line, and ripped a shot that got through Arizona goalie Mike Smith midway through the third period to briefly give the Canucks life. "I think the more we practice together, the more we play together you learn the tendencies and you feel more comfortable," said Vrbata, who also scored with the man advantage against the Calgary Flames on Friday. "I think offensively, it can always be better but it's going pretty well. "(Points) is what's expected from that line. If we're doing that we're giving our team a chance to win." Vancouver's power play finished 26th last season but has provided some new looks under rookie head coach Willie Dejardins, and new talent in the form of Vrbata and rookie forward Linden Vey. "I think it's just the options we have. Every time I get the puck it feels like there's two or three guys open and ready to take pucks to the net," said Henrik Sedin. "It feels like every time we step on the ice something is going to happen. It's a good feeling." However that feeling didn't last long Monday as Joe Vitale had a goal and an assist and Smith made 23 saves for Arizona. 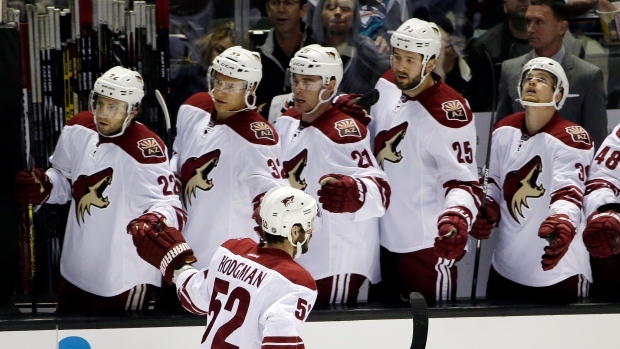 Brandon McMillan, Shane Doan and David Moss also scored for the Coyotes, who improved to 4-0-2 in exhibition play. Oliver Ekman-Larsson added two assists. Derek Dorsett had the other goal for Vancouver (3-2-0), which got 31 saves from Ryan Miller. "They outworked us, and that's a concern," said Desjardins. "We have to look at that. We need a better effort if we're going to win. That's what training camp's for. We've got to be ready when the season starts." Tied 1-1 after the first period, the Coyotes struck twice in the second to put the game out of reach. MacMillan made it 2-1 at 10:55 when his shot was stopped by Miller and rebounded in off Vancouver defenceman Luca Sbisa. Doan then stretched the lead to two on the power play with 1:15 left, deflecting home Mikkel Boedker's shot from the point. A lot was made before the game about Desjardins putting former first-round picks Bo Horvat, Hunter Shinkaruk and Nicklas Jensen together on a line. The trio made their first real impact with the score still tied 1-1 early in the second, buzzing around the Coyotes zone but failing to find the mark. Daniel Sedin then had a great chance off a feed from brother Henrik that Smith handled, before Alexandre Burrows ripped another shot wide of the Arizona goal from the slot. Arizona's Martin Erat almost made it 4-1 four minutes into the third period, firing a shot off the post that stayed out. Horvat, Shinkaruk and Jensen then had another energetic shift but again couldn't get anything past Smith before heading off to a big cheer from the crowd at Rogers Arena. "We knew that we were the young guys and we looked to create energy, use our feet, finish checks — and I thought we did that," said Shinkaruk. "There's things in our game that could have been better, but I thought all in all it wasn't a bad game." Vrbata, who signed with Vancouver in the summer after five years with the Coyotes, gave the Canucks some hope with nine minutes to go, but Moss sealed it off a big rebound in front of Miller with 1:41 remaining. "The Sedin line was really good early. I thought they had lots of good plays — they're dangerous on the power play," said Desjardins. "It's just a process of Vrbata finding his spot in that line and working in." Both teams dressed lineups similar to the ones they will go with once the regular season gets going. Missing out for the Canucks were defencemen Dan Hamhuis and Kevin Bieksa, and forwards Zack Kassian, Brad Richardson and Jannick Hansen. Notable absences for the Coyotes included forwards Sam Gagner and Lauri Korpikoski. Vancouver opened the scoring at 4:43 of the first period when Chris Higgins one-timed a shot from the faceoff dot off the rush that Smith only got a piece of. The puck dribbled towards the goal-line and the hard-charging Dorsett poked it home. Arizona tied things at 12:02 on a play Miller might want to have back. The Coyotes flipped the puck out of their zone and the Vancouver goalie decided to stay in his net instead of going out to play it, allowing Vitale to move in and beat him through the pads. "I just didn't think I could make it there," said Miller. "I didn't want to race out in pre-season and extend myself and tried to play the breakaway." It was the first goal allowed by Miller — who also signed as free agent — in pre-season after he faced a mere seven shots against in just over 30 minutes of action against the Calgary Flames on Friday. "I felt pretty good. A couple tough bounces in the second period (or) it's a little tighter game," said Miller. "Still a few things to chip off and dial in, but I was happy overall with my awareness in the game." Notes: Canucks defenceman Frank Corrado suffered an upper-body injury in the second and did not return. Dejardins said the team will know more on Tuesday. ... The Canucks play their next pre-season game in Edmonton on Thursday before wrapping up the exhibition schedule on Saturday at home, again against the Oilers.